I think I am a Pilot man. For some reason, their pen designs resonate with me, and I have never been disappointed with the quality. Their standard fountain pen inks are excellent, and their high-end Iroshizuku line are some of the best inks on the planet. In the non-fountain pen category they are strong too. Can you say Hi-Tec-C? One of the things that has fascinated me about Pilot is how well their older designs hold up decades later. I have already reviewed the Pilot Murex - a candidate for the best pen ever designed - as well as a remake of the Pilot Myu in the limited edition M90. 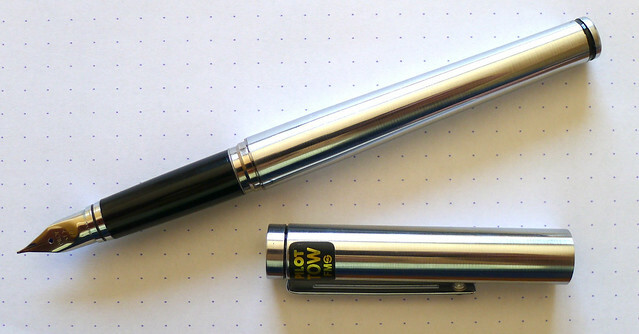 While it is nowhere near as old as the previous two pens, the Pilot Tow shares similar design elements and is much more accessible to the average fountain pen buyer. I am not sure why, but there is shockingly little information available about the Tow online. From what little I can gather, the pen was manufactured in the early-to-mid 2000's ... aaand we're done. Seriously, I cannot dig up much more information on it that that. But having used one I can tell you it is fantastic. There is nothing about the Pilot Tow that I don't like. The stainless steel barrel is solid and has some weight to it, the cap fits tightly, the clip is firm, and the section is smooth and comfortable. The steel FM nib in this model is great as well. 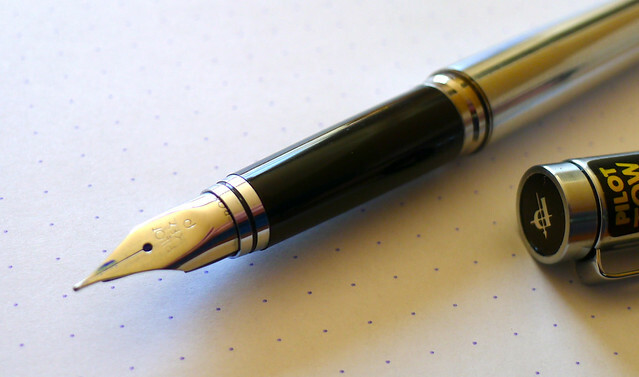 Aesthetically, I like the slightly downward angle of the nib and the slight amount of flex it has when writing. The Pilot Tow is only moderately difficult to find, but when you do you will discover the best part about this pen: You can have your own for around $30. Speerbob is a well-respected seller and often has them available in his ebay store for that price. Writing this review reminded me I needed to order one of my own. An F nib is on the way! 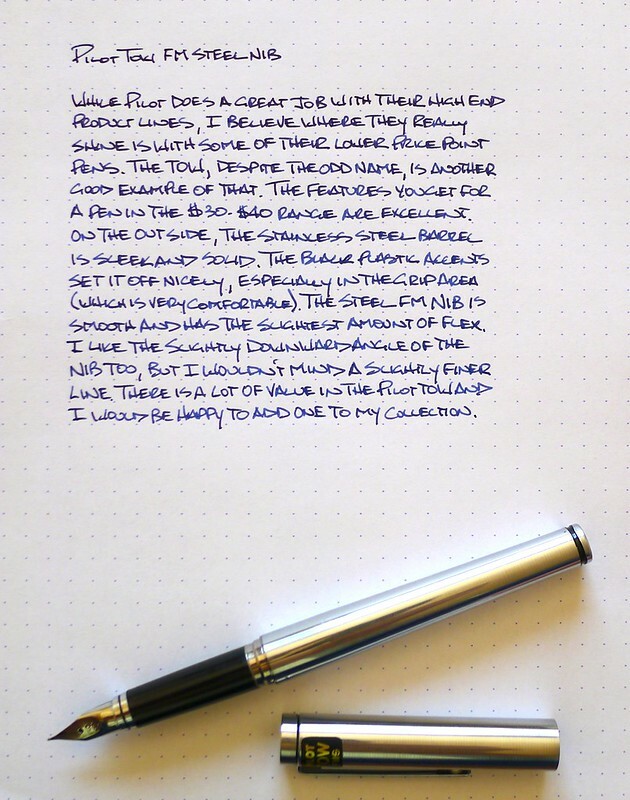 Posted on July 30, 2013 by Brad Dowdy and filed under Fountain Pens, Pen Reviews, Pilot.